To finalize a documentary movie and a photographic exhibition, we need your support. 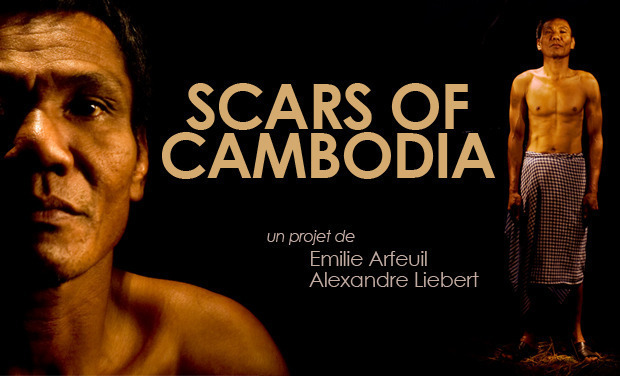 This project aims is a testimony of the Polpot Regime’s History through the portrait of a Cambodian who carries physical and moral scars of it. Tut, a 52-year-old fisherman, told us without words his past for the first time: the massacre of his family and friends, as well as the origin of his scars which show the tortures he endured when he was fifteen in a prison of hard labor. Beyond a reflection about memory, it is an intimate meeting that we want to offer you, to bring back the human being out of inhumanity. When Polpot took control of Cambodia in 1975, he was determined to create a completly new society starting by destroying all the aspects of the former one. His communist regime began by executing systematically every person who had relations with the former government, and built prisons and forced-labor camps. Determinedly agrarians, the Angkar set agricultural population against city-dwellers, accused of being contaminated by the bourgeois imperialism. Phnom Penh was immediately emptied and its population sent to the countryside in camps to work under watch. They laud the intellectuals elimination and the reeducation of adult populations by manual labor. Between 1975 and 1979, this dictatorship killed 1,7 million Cambodians, that is approximativly 20 % of the population at this time. While today the trial of the old government is in progress, what’s going on into the mind of the survivors ? Lost in all current events, this trial seems trivial, essentially for the shape of it, so much the defendants are old now, or else they didn’t already disappeared from their natural death. Cambodia still carries the tracks of this genocide and has to learn how to deal with, without taboos, to reconstruct itself over it. This crime against humanity left moral and physical scars hardly hidden and which the Cambodian population has to live with every day. An omnipresence of History which is so engraved that it becomes the personal history of each. Tut is a witness among so many others, an individual memory which is one of the stones that builds the History of his country. The main question is not to inform again about the tragical History of Cambodia but to show how an individual deals today with the scars of this heavy past: our glance is to bring back the human being out of inhumanity. We met Tut by chance, on a small street of pilotis houses, In outskirts of the city of Kampot, Cambodia. Tut lost, as many Cambodians, a big part of his family and friends under the Polpot regime: his parents and his ten brothers and sisters were killed by the Angkar regime. He showed us tracks in his wrists and ankles, an amputee little finger and some of his scars which show the hard treatments he has been trought in a prison where he spent six months of forced labor, the year he turned fifteen. It is 35 years later that he talks about it for the first time to two foreigners. It is one of these meetings which marks a life. At the foot of your building, in the coffee shop or far at the end of the world. With Tut, it was at first a deep glance, then a warm smile, and finally, after a few days with him, gestures full of love. Beyond his face and attitudes as divine as a movie star, beyond his physical appearance which, in spite of his 52 years old, is the one of a young athlete, Tut is a magnificent person. From fisherman, he became a cleaner, because of cataract problems getting worse every year. He gets up every morning at 5 am to go to the outcry market and achieve his hard labour, which digs him the back and the loins, and brings back no more than 2 dollars a day, with which he has to feed his wife and his foster daughter. After twelve days spent with him, from dusk till dawn, he put our passport photos on his altar, next to those of his parents, his wife and wedding. A deep intimacy was born, and a real confidence built itself day after day. And it is thanks to this trust that for the first time, through the memories of his past, he revealed the horror of the Polpot regime. Our sensibility is similar: human, more sensorial than consensual, and at the same time documentary and artistic. We focus our glances on the same subject, the same event, the same moment; they are particular, personal, different but complementary. It is interesting to put these two glances in parallel, to be able to choose by moments the immobility rather than the movement, even compare them and discover two different readings of a same moment. I concentrate the first part of my work on the buried memory, the way it shows trough gestures, attitudes and glances, the way it marks someone for life and constitutes a person. The memory of his trauma is visible at all times, in the repetition of his habits: cleaning with a tissu at the slightest dust, observing the movements of his cigarette’s smoke and crushing it always the same way, suspending his glance on the photos of his family and lighting a stick of incense. Then his glances which leave far from any present life in one second. To capture all this, I stay from dusk till dawn in the intimacy of his steel and wood house, in this bare everyday life. I wish I can also continue to observe how the first pain of the trauma goes back to the past, little by little, and becomes a wound finally healed which can leave its place to the present and its enjoyments. At the second stage of my work, I describe the scar in the first meaning of the word, as an eternal physical mark. Tut has shown me one day a young boy in the village,of the same age he was when he had been made prisoner. I decided to photograph in parallel both bodies, the adolescent one still blank of any violence marks, in front of the one marked by torture and time. I use the technique called « light painting ». It needs a long exposure time, about 15 seconds, in total darkness. I enlight the skin parts by parts with a maglight, to choose the direction of the light, in a kind of choregraphy. This technique obliges the model to stay totally immobile during all the shooting exposure. It creates a real intimacy between the photographer and the model’s body. This technique requiers many tries and is morally and physically exhausting for both participants. I seek for the scars with the light on Tut’s body to print them on pictures. The direct contact with his marked body creates a really strong and very particular intimacy. This project leans on an artistic approach, it is not at all about a journalistic report. The consensual aspect of the genre is avoided to give birth to the sensory, to pure feelings. I concentrate myself mainly on visual elements - physical scars, gestures, mimes, glances - to expose soberly the feelings and psychological scars of Tut. The purpose is to create a silent, mainly visual and sensorial documentary, where the scriptwriter is Tut himself, by his memory but also his life today. Tut does not speak either French or English; I do not speak Khmer. The unique way of communication is the body language, an intense visual element that possess a real dramaturgic power. The camera is at the same time an observer of this reality where the past resurfaces, but also goes by « mise en scène » to bring to light some aspects of his memories. I decided to apply also the technique of " light painting " in the video and to film both bodies in parallel, the one of Tut and the one ofof the teenager; I investigate their skins in the total darkness, by following the same movements of lamp which paint them of light, as two layers one on the other, by following the same axes, the same values of plan, to show the transformation of the body. Born in Clermont-Ferrand in 1983, I actually live and work in Paris. Since I am fifteen, I practice photography in self-taught and exhibit very young in festivals and galleries. After Cinema and Arts studies in the University Panthéon-Sorbonne in Paris, I worked for some years on short movies, videoclips and avertisings, from first assistant director to director of photography. By chance, I began to work for fashion and advertising photography as a freelance photographer and art director during several years. Today, I have decided to dedicate myself essentially to personal projects, which are mainly documentary ones, and elaborate portfolios for exhibitions and press. My work is based on atmospheres and the feeling of "suspended time", inspired by the realistic paintings and the movies, with a social dimension always on my mind. I had some exhibitions of my work in Parisian or European galleries and in corporate buildings. In 2011, I’ve been a prize-winner of SFR Young Talents " Paris les Halle:s glances of today " in workshop with Patrick Tourneboeuf of the french Agency «Tendance Floue», and exhibited in the Forum des Halles and next to Robert Doisneau at the City hall. This year, I’ve been a prize-winner of 30 to 30 women photographers and Coup de Cœur of the Bourse du Talent Reportage for "Sweet Cambodia". I discovered movies quite late, nevertheless I was rocked all my childhood by the VHS my parents collected. I realized a first experimental short film in Super8, VINGT DONT QUATRE BIS, which allowed me to register to the University Panthéon-Sorbonne. Self-taught, I love technique as much as art, investigate the special, mechanical or digital effects, and discovered some animation skills. I write, direct, manage, edit and build everything from A to Z, passionated by the slightest detail which participates to the construction of my movies. I obtain my Bachelor's degree, as well as the prize of the best short film of fiction in the University Festival of Paris for my short film DOUBLE PUMP. I have created an association with three friends, LOS DESPERADOS, with whom I realize the short film CHIMERE (3 selections in festivals), then my last movie AE [EUDANL' AH] (12 selections in festivals and 5 prizes). Meanwhile, I direct several music videos and experimental essays (BLACK AS SNOW), animate cinema workshops for teenagers and work for a webzine, NOGOMAG, for whom I realize regularly short and funny reports. In 2011, I come back from a solo trip of eight months, with in my pockets an experimental documentary about the city of Pushkar, in India, (HOLY DRUG AND HIS CAMEL) and numerous CINEMATIC WORLWIDE JOKES which decorate my blog INSIDE TRIP TO THE NEXT WORLD. We request today your financial support to continue this work with Tut (shooting, postproduction, animation, music recording and mix) over 4 to 5 months. We wish to share with you this human meeting through a direct investment in the project. We leave to continue the shooting in Cambodia from September 14th.